Moose feeding on Isle Royale. Image: Todd VerBeek, Creative Commons Attribution-Share Alike 4.0 International, 3.0 Unported, 2.5 Generic, 2.0 Generic and 1.0 Generic license. What are moose poop and moose pee good for? Nope, that’s not a middle school joke. It’s a science question. Poop and pee from this iconic species of plant-eaters are environmentally valuable, research at Isle Royale National Park and in northeastern Minnesota shows. You see, moose are herbivores that feed on aquatic plants in the shallow waters of inland lakes and ponds and the bays of Lake Superior. What goes into their digestive systems while they’re standing in the water a few hours a day comes out when they’re on land for the rest of the day. And what comes out is rich in nutrients such as nitrogen, which fertilize the hardwood forests, particularly near stream and river banks – in what are known as riparian zones. “Moose are a link between terrestrial and aquatic systems,” said Joseph Bump, a researcher at the University of Minnesota’s Department of Fisheries, Wildlife and Conservation Biology. His recent study said they “can move ecologically significant amounts of aquatic-derived nitrogen” to the land. “They have unique behavior in the extent to which they feed on aquatic plants” that are rich in nitrogen, salt and calcium, Bump said. 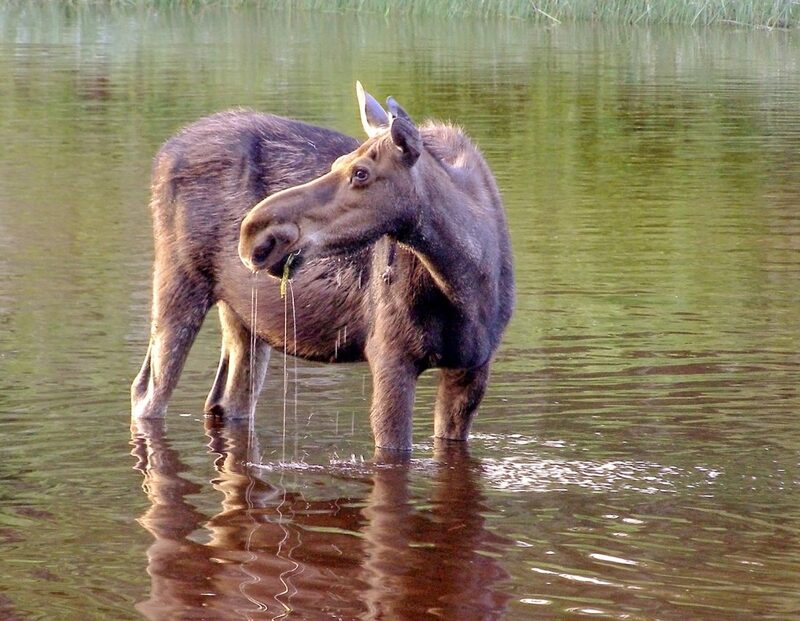 Moose can shut their nostrils and open their eyes underwater. They can even identify plants underwater. On average, a moose can move the equivalent of a 40-pound bag of fertilizer uphill “from the aquatic to the terrestrial systems every summer,” Bump said. The study has implications for Isle Royale’s wolves and moose. Last October, the National Park Service began rebuilding the Lake Superior island’s wolf population to reduce the number of moose and restore a balance between predators and prey. As of 2017, a record-high 1,600 moose lived on the 207-square-mile island where the population has risen in recent years because of the scarcity of the wolves that hunt them. Before the Park Service launched its wolf relocation program, only two wolves remained on the island. There are now 15. In late March, six of the most recent transplants were imported from Ontario’s Michipicoten Island Provincial Park “where they have run out of caribou, their only large prey,” the Park Service said. The goal is to stabilize the island’s moose population at between 900 and 1,200, said Mark Romanski, the park’s division chief for natural resources and coordinator of the wolf translocation program. The long-term average has been about 1,100 animals. The transplanted wolves are already chowing down on moose, Romanski said. In northeastern Minnesota, there are an estimated 3,030 moose, according to a 2018 aerial survey. That population had dropped by about half since 2005. The study said parasites and wolves each account for about one-third of moose deaths in northeastern Minnesota. “Wolves are just one piece of the equation to keep that moose population in check,” Romanski said. Other pieces of the equation include ticks, weather, parasites and other predators, such as bears that can take moose calves in the spring. Romanski said brain worm, a deadly parasitic disease transmitted by white-tailed deer, infects Minnesota’s moose population, but it’s not a problem on Isle Royale which has no deer. Changing climate may affect moose numbers, according to Bump’s study published in the academic journal “Philosophical Transactions B.” It emphasized the importance of considering the climate warming when restoring species. “If deer replace moose with climate warming as is predicted in Minnesota, they will not duplicate the nitrogen (link) function of moose because deer do not feed on aquatic plants to the same extent,” it said. If the Isle Royale wolf relocations reduce the moose population, there could be an increase in water lilies and water shields – plants moose like to eat, Bump said. I remember this being talked about in the Pacific Northwest a few years ago, but there it was bears dragging salmon up onto the bank to the benefit of the trees there. This article from the Alaska Department of Fish and Game says that nitrogen levels in trees correlate with the size of that year’s salmon run.